Sleek monitors and glowing desktop computers covered the tables of GH 240, converting the classroom into a virtual battleground. The dissonant clicks of keystrokes and controllers created a backdrop of sound against the laughter and shouts of players in combat. Ryan Guard, president of NKU E-Sports, called out orders to his warriors as he controlled the party’s damage from his laptop. The night’s battle took place in the digital world of Hearthstone: Heroes of the Storm, a collectible card game in which opponents clash with fearsome creatures and powerful magic. As one player bragged to his neighbor about how quickly the game ran on his “rig,” others were content to play Super Smash Bros. on old, boxy TV sets. However, one set did not seem to work. Metal crunched, and something cracked like it had been yanked free. Spradlin rose from the TV and lifted his trophy, its DVD tray, above his head. The screen then crackled awake, and the game faded into view. Guard shook his head and laughed as Spradlin carried the tray back to his seat. 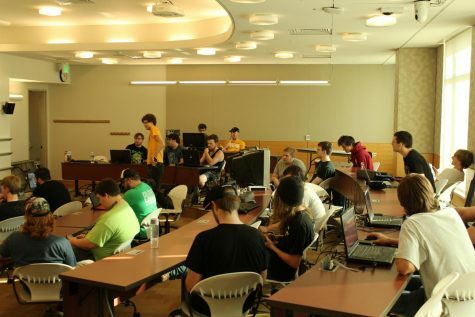 Thirty gamers and spectators brought their computers to the NKU E-Sports team’s first meeting on Sept. 22 to train at Hearthstone, for in just four days their first round of tournament play against college teams from around the country would begin. NKU E-Sports met in Griffin Hall 240 on Sept. 22 to train for their upcoming tournament. The NKU E-Sports team hosts video game tournaments on campus and builds teams to compete against other universities. Esports–the official term used by Major League Gaming–is short for “electronic sports” and refers to multiplayer video game competitions. 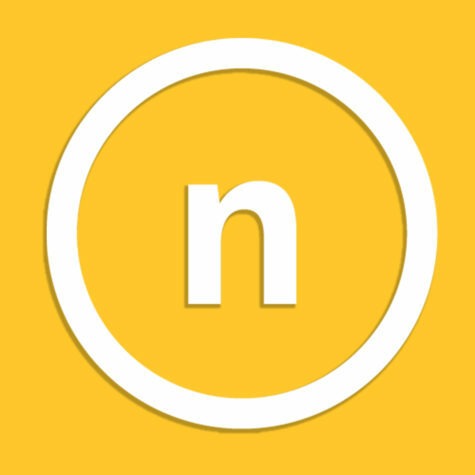 Taking over the role of NKU’s now-defunct MINjas gaming organization, the team competes in League of Legends, Hearthstone, Super Smash Bros. and other games. In its first year as a club sport registered with Campus Recreation, NKU E-Sports navigates several new challenges. Guard explained that leading a sports team requires “more obligation” than leading a social club, but that it is an important part of establishing respect as a team. NKU E-Sports faculty adviser Dr. Alexis Pulos said that esports have been popular in Asia since the 1990’s and are now gaining mainstream attention in the U.S.
Pulos, a communications studies professor, said gaming competitions succeed by bringing together the best players in the world to do battle. He pointed to American gaming arenas like the MLG.tv Gaming Arena in Columbus and esports teams at Miami University, University of Louisville and University of Kentucky as signs of the sport’s local appeal. For NKU’s team, Pulos said, that growing appeal provides a chance to demonstrate the level of skill at which NKU players perform. Their first opportunity is the fall’s Tespa Hearthstone Training Grounds Tournament, a 7-week tournament in which hundreds of teams from universities across the country battle for thousands of dollars in scholarship prizes. Hearthstone: Heroes of the Storm, created by Blizzard in 2014, currently has 70 million players worldwide. The game has rapidly become an esports tournament mainstay, and contests hosted by Blizzard offer cash prize pools upwards of $1 million. Miami University, University of Cincinnati and University of Kentucky also entered teams to compete with NKU in the 2017 Tespa competition. “Gaming rigs” hummed as players trained for the Tespa Hearthstone Training Grounds Tournament on Sept. 22. NKU E-Sports won its first round match on Sept. 26. Guard and Spradlin helped form the NKU E-Sports club in 2014. Both have played in tournaments at NKU and beyond. Guard has been playing video games since early childhood and likes to compete in StarCraft 2. Spradlin played tennis in high school before he dropped sports and started entering video game competitions. Since then, he has competed in Chicago, Atlanta and Japan. The pair likened esports competitions to any other sporting event, complete with rabid fanbases and sportsmanlike intensity. Guard compared amateur gamers’ desire to watch high level players at tournaments to sports fans’ adoration of professional athletes. “If you’re passionate about this one thing, you want to see it played at its best,” Guard said. Guard and Spradlin, who graduate in May, said the feeling of leaving the team they helped build weighs heavy, but they are hopeful for its future. Guard said he would like to see esports grow as a whole and receive recognition like other sports, and Spradlin wants the team to be the top name among Kentucky schools. NKU E-Sports won its first round of the Tespa Hearthstone Training Grounds Tournament on Sept. 26. The team, made up of Guard and seniors Jakob LaSorella and Zachary Wolfzorn, competed remotely from Griffin Hall in a best-of-five match against Ferris State University in Big Rapids, Michigan. Wolfzorn, an electronic media & broadcasting major, said he remembered spirits sinking during the second match after the opposing team used a “Priest” deck, the most powerful in the game. “We lost that one pretty quickly,” Wolfzorn said. The team regrouped and went back on the offensive, dispatching the Ferris State team’s decks with “Hunter” and “Druid” decks in the last matches. Guard, Wolfzorn, and LaSorella, a media informatics and computer science double major, agreed that understanding character abilities and having strategies outlined before the match swung the game in their favor. Guard said winning the first match was a huge confidence boost, especially against a highly-ranked school like Ferris State. “You could certainly consider the match an upset,” Guard said. 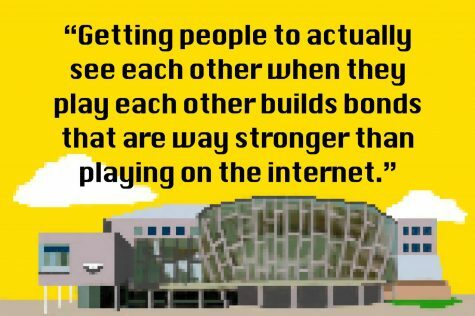 In a field where the pressure of competition and monetary incentives to win are rapidly increasing, Pulos said the goal of NKU E-Sports should always be to create a fun, safe atmosphere for games to be enjoyed. Even at their Sept. 22 training session, the spirit of fun was not lost. People crowded around TVs to laugh and watch Nintendo characters battle. Players discussed their favorite Overwatch characters and new strategies for Total War: Warhammer. Even Spradlin took a break from Hearthstone training to dominate at Street Fighter, which he played with classic arcade controllers. Theirs was a jovial battle party, and the eager warriors were happy to yawp and holler as their enemies fell. But in a medium that by nature keeps players apart, Spradlin said this first meeting was about connecting with each other face-to-face. 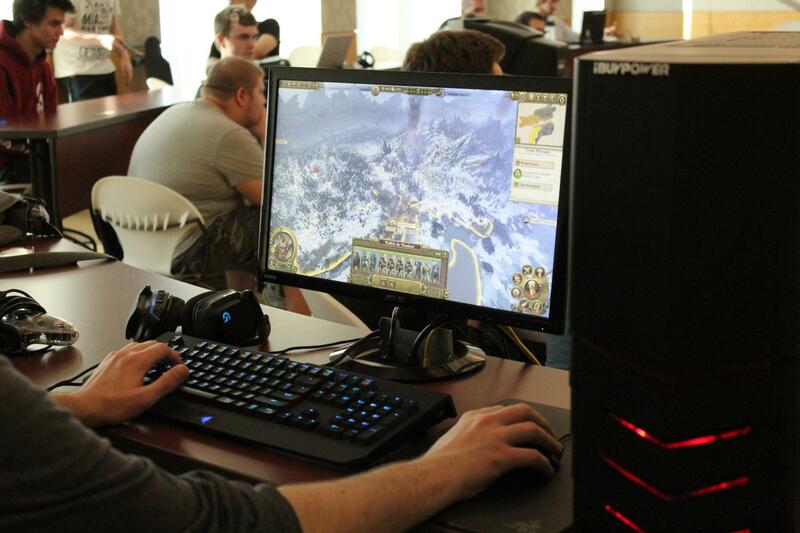 NKU E-Sports faces University of Colorado Boulder in the next round of play on Oct. 3. Tespa Hearthstone Training Grounds Tournament streams 8 p.m. to midnight on Monday and Tuesday nights at twitch.tv/playhearthstone. 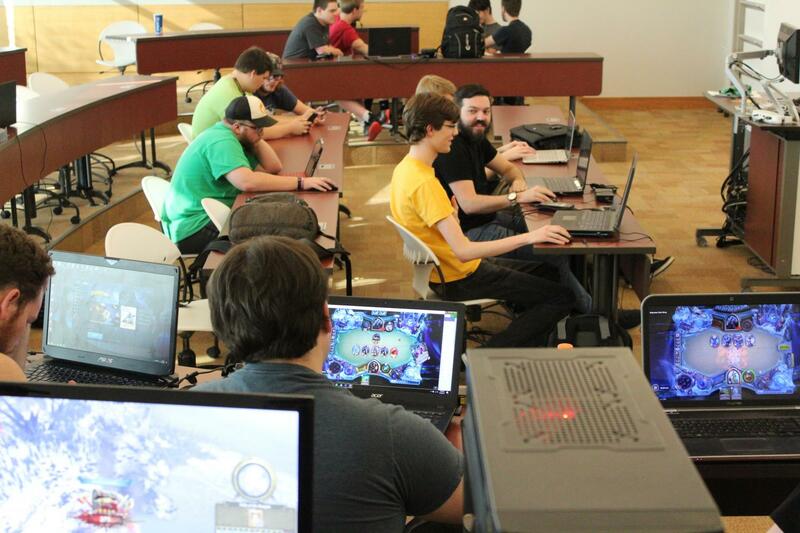 NKU E-Sports will host on-campus game tournaments on Oct. 7 and Oct. 28 in Griffin Hall.